As fitness professionals, you have to work every day with people who are stressing their bodies. Often these are overweight, out of shape and high risk clients. People who might be at risk for a heart attack or coronary arrest. But they aren’t the only ones in danger. Even your fittest (footballers suffered Sudden Cardiac Arrest (SCA) in recent times on play field), most athletic client could choke on a piece of gum on their way into your gym. Would you know what to do? CPR-AED Training is a mandatory requirement for all Fitness (Gym Instructor, Group Exercise, Aqua Instructor), Sports Trainer & Community Activity Programs Coaches. What about first aid? Isn’t that important too? Actually, chances are you are going to run into a cut, scrape, sprained ankle, or upset stomach before you see a heart attack. It is valuable knowledge to have and you’ll likely feel more comfortable practicing as a fitness professional with this skill set. At this time, however, ACE does not require a certificate in First Aid, but an optional training requirement. American Council on Exercise (ACE) requires certification exam candidates to hold current Adult CPR and AED (automated external defibrillator) certificates prior to sitting for the exam. They also require ACE certified professionals to provide proof of their CPR/AED certificates at the time of renewal. But not just any CPR course will do. Online certifications are not acceptable by any of the associations. ACE requires that candidates complete an Adult CPR/AED course with a live skills check. This means there is a living, breathing instructor watching and checking off your skill performance. An online only CPR course alone cannot provide this live skills check. 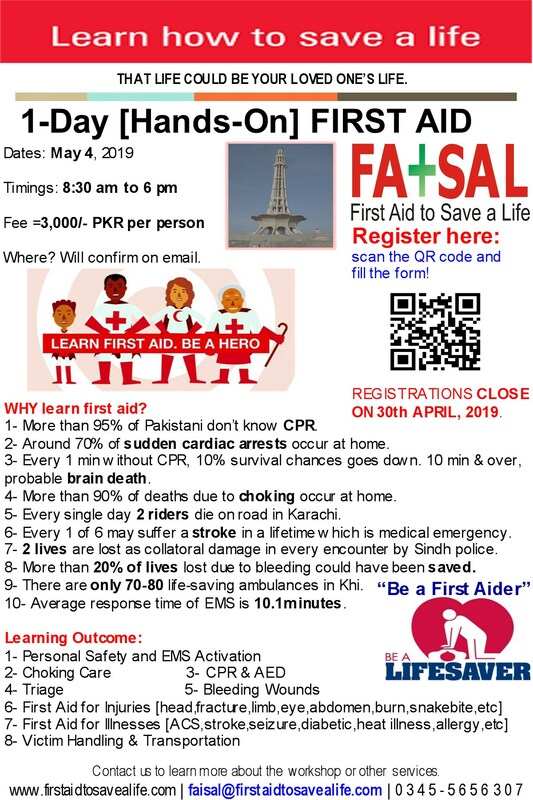 First Aid to Save a Life (FATSAL) Pakistan is pleased to offer internationally accredited practical training course, First Aid, CPR and AED in Pakistan. This is a registered training course and globally recognized. This training program is designed specifically for the first aid providers and fulfills fitness industry requirements. The course is based on the American Heart Association (AHA) and other recognized training and resuscitation organization’s guidelines for CPR, AED and First Aid. This entry was posted in 1-Day Training Programs, First Aid CPR and AED, Fitness Instructors and tagged 400, About 57, AED Requirements for Fitness Instructors, AED Requirements for Fitness Trainers, AED Requirements for Physical Instructors, AED Training Requirement by Australian Fitness Academy, AED Training Requirement by International Sports Science Association, AED Training Requirements for Fitness Coaches, AED Training Requirements for Fitness Trainers, AED Training Requirements for Physical Trainers, AFA), American Council on Exercise, Australian Fitness Academy, Australian Fitness Academy (AFA);, CPR Requirements for Fitness Instructors, CPR Requirements for Fitness Trainers, CPR Requirements for Physical Instructors, CPR Requirements for Physical Trainers, CPR Training Requirement by Australian Fitness Academy, CPR Training Requirement by International Sports Science Association, CPR Training Requirements for Fitness Coaches, CPR Training Requirements for Fitness Trainers, CPR/AED Requirements - American Council on Exercise, First Aid Requirements for Fitness Instructors, First Aid Requirements for Fitness Trainers, First Aid Requirements for Physical Instructors, First Aid Training Requirement by Australian Fitness Academy, First Aid Training Requirement by International Sports Science Association, First Aid Training Requirements for Fitness Coaches, First Aid Training Requirements for Fitness Trainers, First Aid Training Requirements for Physical Trainers, Fitness Training, IDEA Health & Fitness Association, International Fitness Association, International Sports Science Association, NAFC, NETA National Exercise Trainers Association, Personal Fitness Trainer Certification, Personal Fitness Training, Personal Trainer Certification. Bookmark the permalink.